Our Wine Pairing Weekend Challenge this month was Hors D'oeuvres with a Sparkling Wine in Celebration of the Holidays hosted by Jeff of Food, Wine, Click. I have two wonderful appetizers that I adapted from Williams Sonoma that I like to serve during the Christmas season and this year I paired them with a Prosecco from Cupcake Winery. Prosecco is a very dry wine and many people like to make Prosecco Cocktails by adding Framboise, Chambord, Grand Marnier or other flavored liqueur to it but I like it just as it is. I thought it was a perfect pairing for the appetizers that I am sharing with you today. 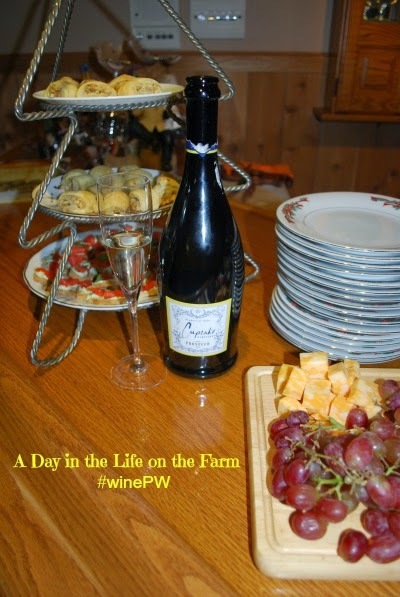 I served this Prosecco from Cupcake Winery out of California's Central Coastal Region. My brother and his family live in this area and one of our favorite things to do when we visit with them is to go for rides through the beautiful countryside, stopping at wineries along the way. This is an easy and elegant appetizer that paired well with the Prosecco. Remove crusts from the bread and cut in half to make triangles. Place on a cookie sheet and bake at 350* until lightly golden, about 15 minutes. Turn over and bake another 5-10 minutes so that the other side toasts as well. While bread is toasting, place cream cheese, watercress, salt and pepper into a food processor and puree until smooth. 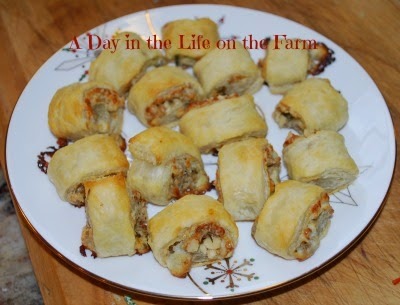 I also served these Blue Cheese and Walnut Puff Pastry Rolls adapted from the same cookbook. The original recipe called for Roquefort Cheese but I had Blue so that is what I used. Start with a sheet of Puff Pastry Dough. Roll it out a bit and cut in half lengthwise. Spread with the Blue Cheese Mixture. Sprinkle with finely minced Walnuts and a bit of minced Rosemary. Roll each half lengthwise, pinch seam shut and then cut into 1/2" slices. Place on a parchment lined baking sheet, seam side down. Place baking sheet, containing the pastries into the freezer for at least 15 minutes. Then transfer the cold baking sheet to an oven preheated to 400*. Bake for 12-15 minutes until the rolls are puffed and golden. Line baking sheet with parchment paper. 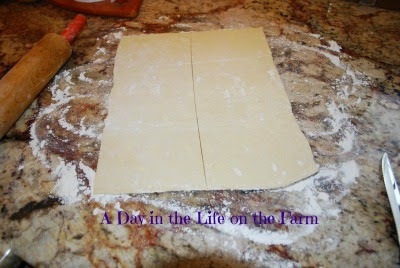 Lay the pastry sheet on a lightly floured surface and roll out the seams. Cut the sheet in half lengthwise. 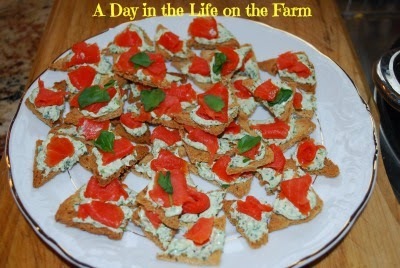 Using a fork, combine the blue cheese with enough cream to make a spreadable paste. 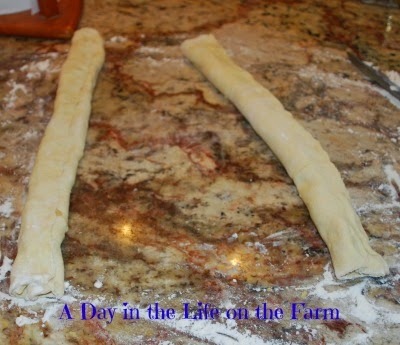 Spread half of this mixture onto each pastry sheet to within a 1/4" of the edges. Sprinkle with the nuts and rosemary. Starting at the long side, roll each sheet and pinch the seams shut. Cut the rolls into slices 1/2" thick with a sharp knife. 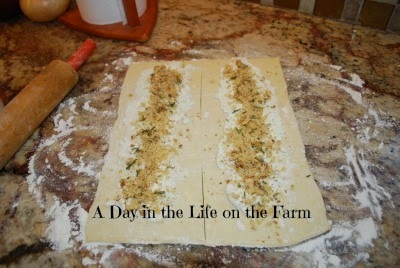 Place on parchment lined baking sheet and place the sheet and pastries into the freezer for at least 15 minutes. When ready to serve, preheat the oven to 400*. Remove the baking sheet from the freezer and place it directly into the preheated oven. Bake for 12-15 minutes, until the rolls are puffed and golden. Here are the ideas available from our group for you. Try something new this year! Two wonderful appetizers! Count me in for the party! Yummy! Both your appetizers looks wonderful Wendy! In fact, the Toast Point and Smoked Salmon are similar to my Potato Chips and Smoked Salmon appetizers. I see both of these being a good pairing with Prosecco. Bravo! Yes, I just got done looking at your post and commmented on how smoked salmon and bubbly get along so well together. Lovely pairing. Looks delicious. Thank you for sharing! Appetizers look wonderful. Now I am salivating!! Blue cheese and walnut sound yummy! Like the prosecco choice. They were yummy. Thanks Jennifer. Finger food for the next party! Luv me some Prosecco. Both of your appetizers wonderful choices for satisfying guests. You mixed it up with flavor, texture and temperature. 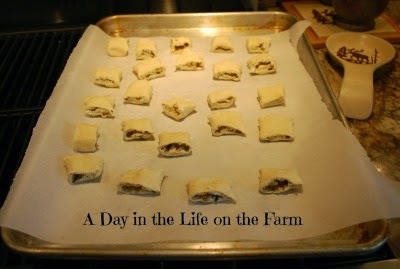 The Blue Cheese and Walnut Puff Pastry Rolls sound especially good now. Thank you! Thanks William. Let me know how you like them if you decide to make them. They are easy peasy and look like you fussed.